One of the frustrations for customers is having to wait a long time on hold, and calling again because no one is available to answer their calls. Outsourcing your customer support to a 24/7 customer support service company can mean giving your clients access to 24/7 support services. It is almost impossible for companies to work for 24 hours a day. This is further complicated when referring to all online and offline resources. Outsourcing customer service to the right company will make it possible for your company to be able to run 24 hours non stop. Normally, if you have a business, there are people who call your customer 24/7, even when the door is closed for the day. So when you are closed for the day, you are going to miss those calls, but when you outsource your customer support service to a reliable company, you should be assured that all calls will be attended to. If you outsource your 24/7 customer support, you can prioritize and focus on the core competencies of your business instead of answering phone calls. You could free yourself of much stress and also avoid having to waste time sorting simple issues that could be solved using your 27/customer support line. Outsourcing your 24/7 customer service also ensures that your customers get the help they need, when they need it. This will make them happier and have less stress. 24/7 customer support providers also have the ability to absorb a dramatic change in demand. 24/7 customer support providers are dedicated to providing the best possible customer service for your business, which means they are experts in their services. However, you're not trained like them. You can give them your instructions and receive exactly what you want. Outsourcing your 24/7 customer support can eliminate the simple issues immediately without having to be passed on to you, since the agents taking the call can instruct your customers accordingly. This means that your team is always available to deal with major issues more quickly too, as well as providing great customer satisfaction for those who have called needing immediate assistance. Companies that manage their own customer support service often face higher costs. Outsourcing converts fixed costs into variable costs and allow you to budget effectively. There is no need to invest in training employees or buy expensive technology. Outsource your customer service to a trusted provider, and save on capital expenditures, time and effort. For a competitive company, 24/7 customer support is one of the most efficient tools to serve your customers. 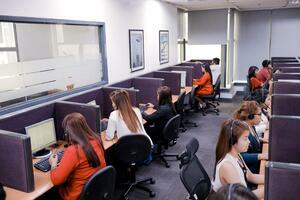 One Contact Center (OCC) offers 24/7 customer support services to companies as well as small business. We have a team of professional workers who are already trained for this task. Don’t stress yourself anymore. Contact us today and let us handle your customer support service professionally.